The Perfect Peel Skin Treatment At Oxfordshire Skin Clinic Lumiere Medispa. The Perfect Peel is a unique chemical skin peel that works by deeply exfoliating the surface layers of skin, removing wrinkles, hyperpigmentation, and is also a successful treatment for melasma and acne. Chemical peels work by deeply exfoliating the surface layers of the skin, forcing your body to quickly replenish it with new cells. When peels are performed the skin begins to rejuvenate itself like younger skin. Peel treatments improve skin texture and firmness, decreasing fine lines and wrinkles. Peels also even out skin tone, improve acne-prone skin and reduce pore size appearance. Chemical peels work by deeply exfoliating the surface layers of the skin, forcing your body to quickly replenish it with new cells. Medical prescription skin products may be advised, where not contraindicated, to be used for 2-4 weeks before and after a Perfect Peel. These in themselves will form part of the treatment and will increase skin cell turnover and even the skin tone, as well as prepare the skin to reduce the risk of post peel complications. PLEASE NOTE: Chemical peels should only be performed by a trained skin healthcare professional in order for them to be delivered safely and effectively. How Is The Perfect Peel Different To other Peels? 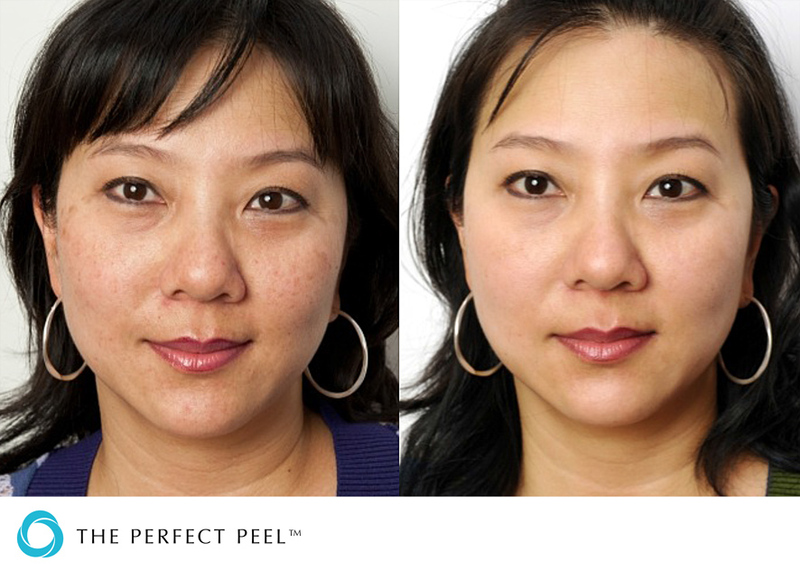 The Perfect Peel combines intense ingredients with effective acids to deliver outstanding results after one treatment. This unique formula allows for an increase in lifting of fine lines and wrinkles as well as a lightening of Melasma, sun damage and Hyperpigmentation. The Perfect Peel is a non-invasive relatively pain free treatment that entails only 5-7 days of peeling. After one treatment of The Perfect Peel, overall skin tone and complexion will appear smooth, glowing and fresh. Depending on skin conditions, multiple treatments may be necessary for desired results. A series of 2-3 treatments applied once every 4 weeks will allow for optimal results for more severe skin conditions such as Melasma and active acne. How Severe Will My Peeling Be? What Will i Look Like After My Perfect Peel Treatment? Immediately after the peel has been applied the skin will either appear red, like a sunburn, or darker. On day three peeling will begin. The Perfect Peel home care moisturiser (included with each peel) will reduce the visibility of peeling by hydrating. By day six or seven the peeling process should be complete and the results are visibly astonishing. Is Sun Exposure Allowed After My Perfect Peel Treatment? Will The Perfect Peel Help Improve My Acne And Acne Scars? The Perfect Peel formula was designed to help improve various problematic skin conditions. Acne is a major factor in what this treatment is tailored to resolve. The Perfect Peel helps minimise the damage and scarring done by acne. The Glutathione helps increase cellular turnover to dramatically improve stubborn acne scars. A series of peels will be necessary to diminish the damage and scarring. Will The Perfect Peel Improve My Skin? The Perfect Peel will help erase fine lines and wrinkles, reduce enlarged pores, help build collagen and elastin which will help to tighten and firm the skin. In addition, it will reduce or even eliminate Hyperpigmentation and Melasma. Acne and acne scars are dramatically improved. The treatment fights free radical damage to remove discoloration due to sun damage and even out overall skin tone and complexion.